With ByD1705, the partners can offer support for incident processing to one or more customers, from a central ByDesign tenant that is owned by the Partner. With this new feature, the customers together with the partner can configure the partner as a support provider ( without any involvement from SAP). Partners can provide support to one or more of their customers centrally from their own tenant. 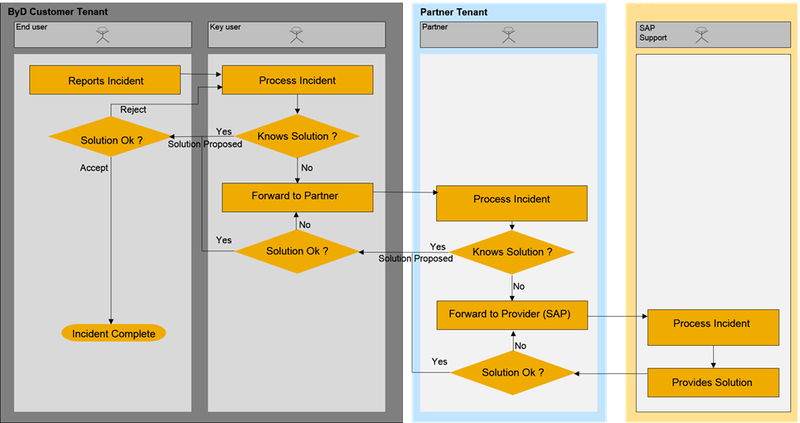 In case an Incident is forwarded by Partner to SAP, the customer can see the communication happening between SAP & Partner. Customer has the possibility to have more than one Partner as Support Provider. Customer has the flexibility to selectively forward Incidents to SAP or Partner. Below are some pointers that might be of help in getting the system ready for the using this functionality. The function can be activated by customers and the partners by scoping the relevant business option in their respective tenants via the Business Configuration scoping question ‘Built-in Services and Support-> Education and Support Services-> Built-in Support’. The partner needs to be represented in the customer system as a Business Parter (Type: Supplier). In case the partner doesn’t exist as a supplier already in the system create one. (Work Center: Business Partner Data > under Common Tasks > New Supplier). It is important to maintain the communication details like telephone, e-mail for the supplier. This information would be used by SAP to contact Partner, in case the incident is forwarded by Partner to SAP. Similarly,the partners would need to create Corporate accounts (Work Center: Business Partner Data > under Common Tasks > New Corporate Account) that would represent the customer in their systems. It is important to maintain the communication details like telephone, e-mail for the account. The communication between the customers and partners is carried out via communication arrangements created on both Customer & Partner tenants. In the customer system, the communcation scenario to be used is ‘Customer to Partner Support Request Integration’. In the Partner system, the communication scenario to be used is ‘Partner to Customer Support Integration’. In the communication arrangement of the customer’s system, the path that needs to be used in the ‘Technical data -> Advanced Settings-> Outbound tab is ‘ /sap/bc/srt/scs/sap/partnersupportrequestprocessin’. In the communication arrangement of the Partner’s system, the path that needs to be used in the ‘Technical data -> Advanced Settings-> Outbound tab is ‘/sap/bc/srt/scs/sap/sapsupportrequestprocessingpar’. The Work Center ‘Customer Support’ needs to be assigned to the user on the partner side in order to use this functionality. Watch this demo to get more insights into this topic. Hi Divya, Great demo and really hands-on! I do have a question related to the communication between (customer-)end-user – (customer-)key-user and (partner-)IncidentManager – (partner-)SolutionExpert: how can I pro-actively inform these actors in case they need to perform an action? Example: now the (partner-)SolutionExpert has to check the Support workcenter each hour/day in order to see the new incoming incidents…. Is there a nice way to configure this with e-mails or otherwise? Currently we don’t have the Notifications (with email subscription) capability for this functionality developed. We have received this feedback from other Partners who are using this functionality and this has been already added to our backlog, to be considered for future development roadmap of this functionality. Depending on the priority this receives in our list of backlog items, this might be taken up for development in one of the earliest possible releases in the future. Since ByD release 1802, the Task notifications have been made available for Partners. This notifications can be seen from Home > Work > Inbox. When an incident requires partner action ( (for example, there is a reply from the customer to partner), a notification is sent to the Partner employee, who is processing the incident. In order to get e-mails you need to subscribe for this notifications using the “Subscribe to Tasks” button in the Home Work Inbox. We (Partner) have a C4C as a productiv system, not ByD. Our customer are ByD customers. Can we connect the ByD customer tenants to our C4C? Sorry, this feature is currently available only in ByD. In other words, this feature can be used only if both Partner & Customer are using ByD. Hi, I am working in the Partner Management in Germany. Question: Is this process also valid for partners in their demo tenants?